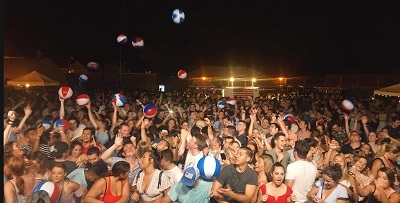 The Jersey Shore with 127 miles of scenic beachfront is attracting crowds who come to enjoy getting outdoors to take in some Jersey Shore vibes with good high energy music, alcoholic drinks, and typical Jersey Shore food. A casual bar & grill located at the North East corner of the Grand Arcade within Asbury Park's historic Convention Hall. 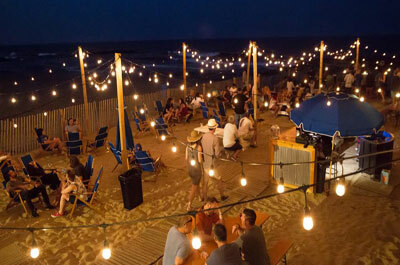 It's the only bar on the beach in Asbury Park you can enjoy your drinks and sit with your toes in the sand. They have both an inside and outdoor bar right on the beach.They are known for their killer rum bucket. Located on the water with great views of the Shark River and the marina. The entire bar is outside along the river. A good menu of comfort food, good drinks, try their Rum bucket drink. 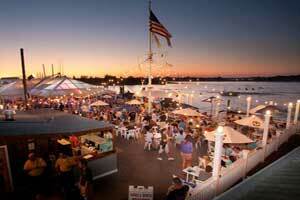 Enjoy a spectacular view from the pier with live entertainment from their stage. 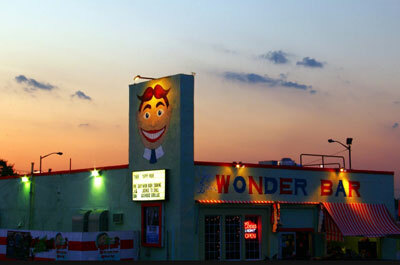 One of the most popular Jersey Shore bars. They have events every night of the week with a great happy hour of Friday's great bands on Fridays and DJ and dancing on Saturdays. There is an awesome outside bar and volley ball courts. 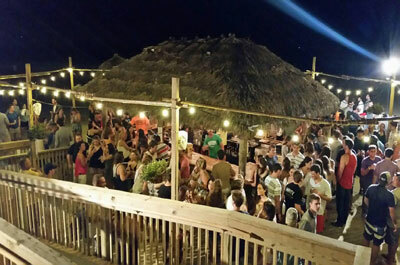 A great location on the beach and a great spot to have some drinks and take in the Friday night bonfires on the beach. Also a good spot for people watching and the Asbury Park fireworks. Don't miss their 32 oz rum buckets. They have live band & Dj music with a different theme for each night. 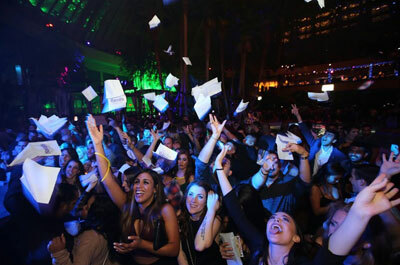 D'Jais is a high energy bar known for it's diverse atmosphere in which different music can be heard seven nights a week. With sounds ranging from live classic rock & roll, reggae bands and the Tri-State's best DJ’s Spinning the latest dance & club. Plus Special events by top billboard artists & Celebrity guest appearances. 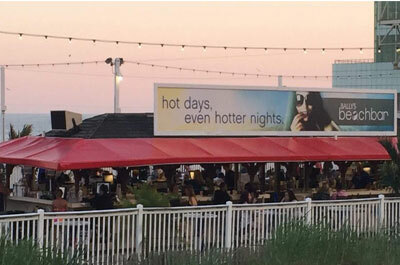 This iconic Monmouth County Jersey Shore bar, located on a private beach, is one of the most popular spots with live bands performing on the beach. This new structure is larger than the old one. 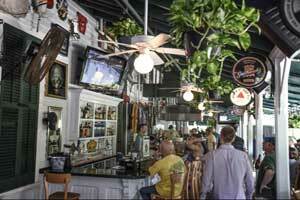 Donovan's now has three bars -- an indoor bar, a bar on the patio, and a bar directly on the sand. It continues to be a hot summer destination for a wide cross-section of patrons including college students, commercial fishermen, construction workers, musicians, and high income Millennials. 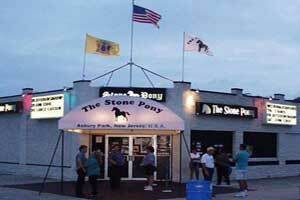 The Stone Pony, one of the world's best known music venues, received notoriety with appearances by Bruce Springsteen, members of the E Street Band, Ronnie Spector, Santana, and Lee Dorsey, brought The Stone Pony and Asbury Park to the national spotlight. 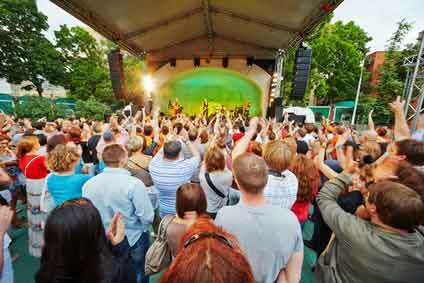 Their outdoor summer stage overlooks the beach; open from May to September as it plays hosts to many big artists. 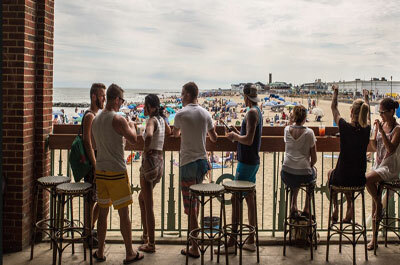 This longtime favorite Jersey shore bar is a popular spot with a capacity for more than 1,100. They have major cover bands . 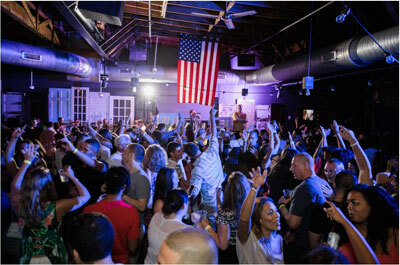 There are three areas with different music and bar themes including an area for a live band in the main room, a sports bar, and a techno/DJ. This is the spot where Bruce Springsteen had his first legal drink, during a Bo Diddley performance at the club. 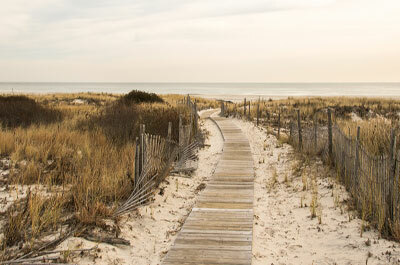 The scene is immortalized in Springsteen's "Seaside Bar Song." An energetic club with two dance floors, three bars, great lighting, and music. 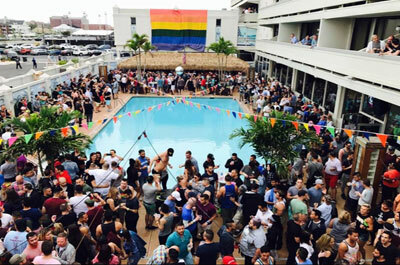 Frequented by the Gay community, though straight people are welcomed. 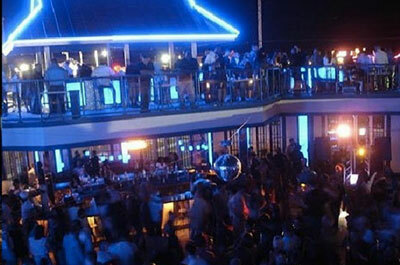 A great place for pool parties, and after parties when there are popular events in town. Tea dances on Sundays are popular --- poolside during the summer. 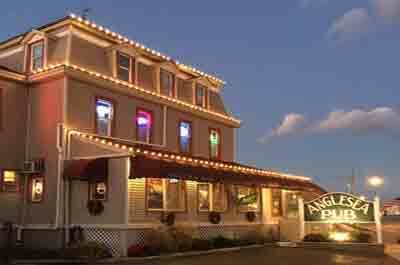 This longtime popular Jersey Shore bar continues to shine. Located in an attractive Victorian house, this is popular spot on Friday nights. 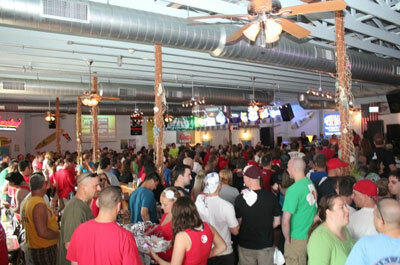 It's a large place with several bar areas that get packed on weekends. 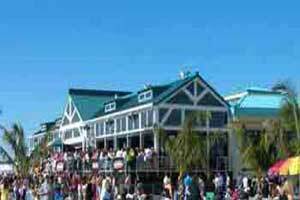 They have live band music Try their famed raw bar with dinner on the porch. The ambiance is rustic, industrial chic with communal table seating, a huge bar, and in the warmer months they have outdoor seating with a beer garden atmosphere. They serve the best pizza in Asbury Park. After 10pm, families leave and the 21+ crowd arrives and the DJ's and live bands take over filling the bars and dance floors with high energy. Made popular by the MTV Jersey Shore Series. This is a huge glitsy bar & dance scene with neon lights, mirrors, high energy, dancing, and great DJ's. 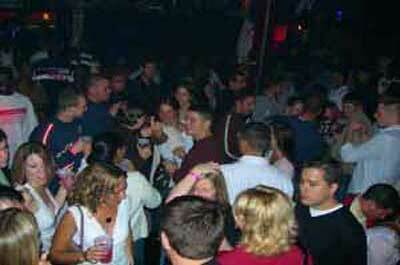 A top Jersey Shore Hot spot with high energy and a mix of Live Bands and DJ's. Lot's of fist pumpers and fist pumping music In the summer their awesome beach bar is open with a good selection of craft and imported beers, wine, and cocktails along with comfort foods. 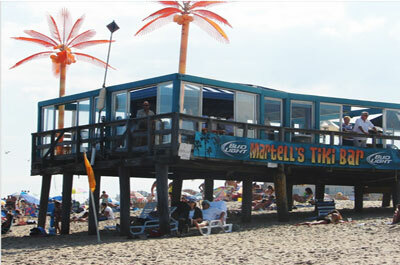 A great beach summer bar with live music during the day and night. They feature a large stage on a pier out over the water. They have a private beach and beach club allows you to sun, swim and with access to the Tiki Bar. Good location with a scenic spot on the Manasquan River. Live band on most nights, Wednesday nights feature name, cover bands. Menu is typical Jersey shore limited menu with a raw bar, fried and boiled seafood, and burgers. Convenient for boaters who can pull up and dock. 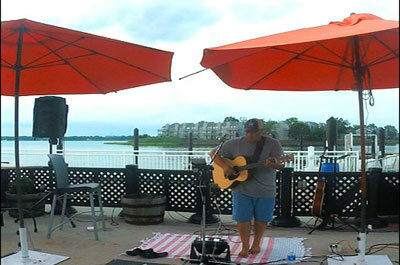 A great location on the beach, and a great spot to take in the beach atmosphere in AC with live bands, DJ's. Typical Jersey Shore beach menu served by bikini- clad waitresses. The Bungalow serves up ocean-front & poolside dining, either on our Boardwalk Terrace or rooftop deck overlooking the beach!. They boffer comfy lounge chairs and cabanas and live entertainment – along with frosty cocktails and a hookah hookup! On the weekends, our beach turns into a day club with the hottest DJs, VIP bottle service, daybeds, cabanas, and lounge chairs. 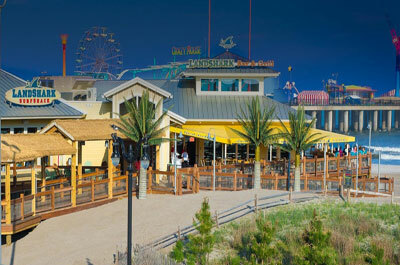 Located on the beach, it features retractable walls to provide spectacular views of the ocean, the beach and Boardwalk. The outside beach bar offers seating outside on the sand next to beach. Music appeals to an older 50+ crowd. Has a scenic harbor view of the marina over looking the bay and downtown Atlantic City. Good sunset views. Great place for drinks on a patio and listening and dancing to live band music. An Irish pub with a colorful history dating back to when it was the Hotel Germantown in 1885. Great Friday Happy Hour's with good Irish live band music. A popular place with the Philly Irish-American summer vacationing crowd. 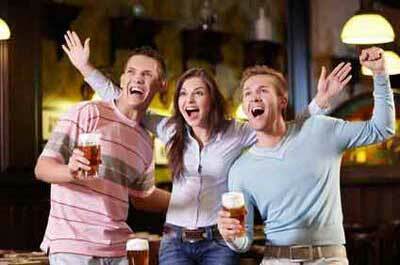 Live bands and nightly food and drink specials and no cover charge with a dance floor and nice patio bar.